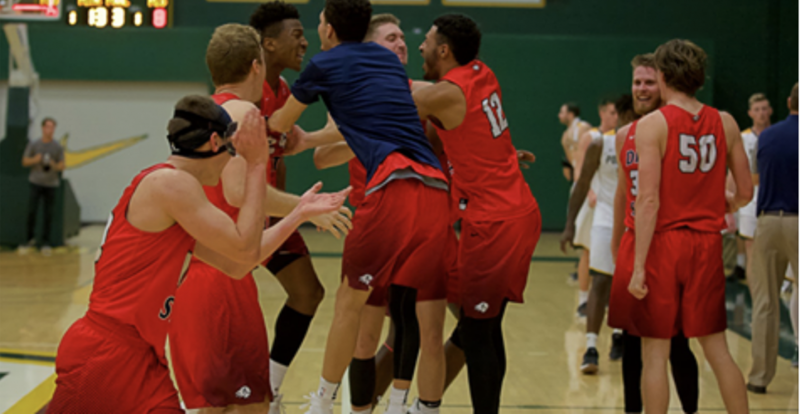 SAN DIEGO – Behind 35 combined points from its senior guard tandem of Trevor Hill and Brandon Simister, Dixie State clinched the outright Pacific West Conference regular season title and pushed its winning streak to 15-straight with a 76-65 triumph at Point Loma Saturday afternoon at Golden Gymnasium. DSU finished the 2017-18 regular season with a 21-6 overall record, 18-2 in PacWest play, while the 21 wins are the second-most in the program’s NCAA era. Meanwhile, the Trailblazers’ conference crown, their sixth (and final) in 11 years of league membership, also earned DSU the top-overall seed in next week’s PacWest tournament. The Trailblazers looked like they were well on their way to celebrating on the Sea Lions’ (21-8/15-5 PacWest) home court after they closed the first half with a 19-2 run to turn an 18-17 deficit into a 36-20 halftime lead. DSU’s defense held Point Loma scoreless over the final eight minutes of the period as the Trailblazers tallied the final 13 points in taking a 16-point lead into the locker room. DSU extended that run to 21-2 on its opening possession of the second half with a Simister leaner in the paint that pushed the lead to 38-20. That bucket seemed to wake up the Sea Lions, who countered with 20-6 spurt to trim the deficit to 46-43 after a Josh Rodriguez 3-pointer with 14:30 to play. PLNU nailed four treys in its run, while DSU missed five of eight shots and committed three turnovers over that five-minute span. Simister stopped the run, though only momentarily, with his third 3-pointer of the night to push the DSU lead back to six at 49-43. However PLNU would counter that Simister make with seven-straight points to reclaim the lead at 50-49 with just over 12 minutes to go. The two teams battled back and forth from there through one tie and seven lead changes before PLNU took its final lead at 61-60 with 7:25 on the clock. Simister nailed a tough 8-footer in the paint and tallied four points in that stretch, while junior reserve Dub Price nailed a clutch 3-pointer and scored seven-straight points to help swing the momentum back DSU’s way. And swing it did as the Trailblazers closed the game with a decisive 16-2 run, including eight points from Hill as part of a 10-0 spurt over a five-minute span. Hill connected for two deep 3-pointers, while fellow senior Isaiah Clark hit two big lay-ins, and Simister and senior Kyler Nielson combined to go 4 of 4 at the line to close out the championship-clinching win. “Wow, what a game,” DSU Head Coach Jon Judkins said. “We played a great first half and then [Point Loma] came out in the second half and threw a couple big punches at us, and we were backing away. But then we finally figured some things out, threw a couple punches back, and that got us going again. Simister scored 13 of his game-high 19 points after halftime as he hit 6 of 7 from the floor, including a perfect 4 of 4 shooting in the second half. Simister also nailed three of his four 3-point attempts and in the process, tied DSU’s single-season record for made 3-pointers with 60 (Tom Whitehead – 60, 2010-11). In addition, the senior guard played all 40 minutes and dished out six assists with three rebounds and a steal. Meanwhile, Hill was just as accurate from the floor as he poured in 18 points (10 in the second half) on 6 of 8 shooting to go with five rebounds, five assists and a game-high four steals. Hill’s last steal of the night, which came at the 9:06 mark of the second half, moved him atop DSU’s single-season steals list with 56 overall (Ryan Sanchez – 55, 2008-09). Price added nine points off the bench, while Nielson, Clark and Austin Montgomery each chipped in eight points. DSU shot better than 57 percent in both halves to finish with a blistering 58.3 percent (28 of 48) clip from the field, including 7 of 11 from the perimeter. DSU also outrebounded PLNU 33-28, which was bolstered by a 22-9 count on the glass in the first half. Point Loma finished 41.4 percent (24 of 58) from the floor, 25.9 percent (7 of 27) from beyond the arc. Ziggy Satterthwaite led three Sea Lions in double figures with 16 points, 14 of those coming in the second half, to key PLNU’s rally, and a game-high 11 rebounds. 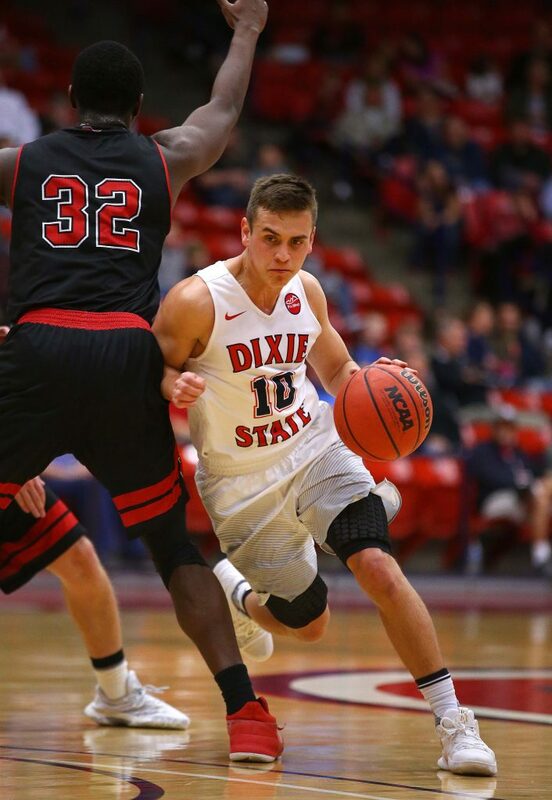 Dixie State will now move on to the 2018 Pacific West Conference Tournament (opponent TBD), which will be held next weekend, March 1-3, at California Baptist’s new Events Center in Riverside, California. The winner of the tourney will earn the PacWest’s automatic bid to the 2018 NCAA West Regionals, which will be held March 8-10 (site TBD). The Trailblazers (12-15, 8-12 PacWest) battled and stay closed through the first half, but went cold during the third quarter and couldn’t make up the difference in the final period. All five DSU starters finished in double-figures led by Ashlee Burge, who finished with a double-double 14 points and a career-high 21 rebounds in her final collegiate outing. Dixie State opened the game with three consecutive baskets to jump to a 6-0 lead less than two minutes into the contest. Point Loma countered with a 7-3 run to trim the lead to 9-7, but DSU answered with an 8-0 spurt to push the lead to 17-7 at the 1:57 mark. Four different DSU players scored during the stretch as the visitors grabbed the early momentum. The Sea Lions trimmed the lead to four points at 22-18 two minutes into the second quarter, but the Trailblazers answered with a 7-3 spurt to build the lead back to 29-21 at the 5:50 mark. PLNU countered with a 14-2 run to take a 35-31 lead two minutes later. The teams traded baskets until Mariah Martin (Sandy, Utah/Alta HS) converted a traditional 3-point play with six seconds remaining to trim the PLNU lead to 42-41 at halftime. Dixie State went cold in the third quarter as Point Loma cruised to a 23-7 scoring advantage in the frame to build a 65-48 lead heading to the fourth quarter. The Trailblazers fought back in the fourth quarter, outscoring the Sea Lions 20-14. However, PLNU answered when it needed to, and the visitors could not make up the deficit, eventually falling 79-68. Dixie State shot 38 percent (27 of 71) from the field, 19 percent (4 of 21) from 3-point range, and 66 percent (10 of 15) from the free throw line. Burge’s double-double (14 points/21 rebounds) led five DSU players in double-figures, while Maile Richardson added 13 points, Taylor Moeaki chipped in 12 points, Martin finished with 11 points, and Matti Ventling scored 10 points. The Trailblazers close the 2017-18 season with a 12-15 overall record, seven games better than the 2016-17 campaign, and an 8-12 mark in PacWest play.